How would you redesign the guardian? Do you feel like the guardian could be much more? That his mechanics don't do his theme justice? Maybe his elite specializations have a weak design? Or do you just want to post some crazy ideas? Well, then this thread is for you. So, just for fun, how would you redesign the guardian? I like guardian quite a lot, but I feel like Virtues are just too simple and forgettable, specially when compared to what the other professions can do. Virtues feel like just some bonus signets, and that's kinda sad. So, what about a transformation? It wouldn't be too unique, since the necromancer already has the Death Shroud, but I'm going to assume the necromancer is getting it replaced by something else, like minion master controls or whatever. A transformation feels more suitable for some kind of holy avatar anyway, like dervishes in GW1. Let's call this new mechanic the Avatar. Avatar of Justice: Burning blue flame archangel, wielding a greatsword. DPS role. 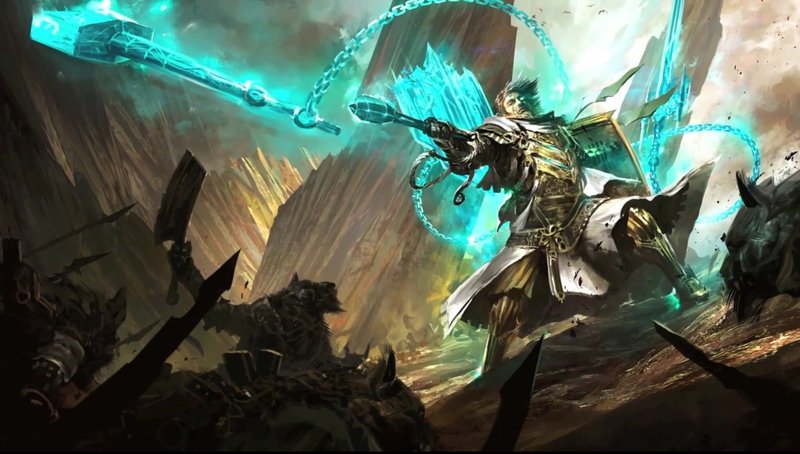 Avatar of Resolve: White light archangel, wielding a staff. Healing role, equal to druid capabilities. Avatar of Courage: Yellow crystal archangel, wielding a shield and a spear. Tank, crowd control, and support role. You would be able to switch transformations from one to another without cancelling the current transformation. This new mechanic would make the guardian stand out more clearly among his peers, and give us a strong healer option without the need of an elite specialization. Following the above idea, the dragonhunter would need something new. What about a falconer theme, with a pet? The dragonhunter would befriend a new exotic beast in the jungle, the phoenix, a large bird with magical properties, inspired by GW1's Rainbow Phoenix. It would be similar to a wyvern pet, flying around the enemy and engaging at melee combat. The three original transformations would be gone, replaced by pet controls for the phoenix. The dragonhunter would get a single new transformation in F5, called the Avatar of Vengeance, wielding a longbow. The skills while transformed would depend on the active phoenix pet. Crimson Phoenix: Based on the Avatar of Justice. Sapphire Phoenix: Based on the Avatar of Resolve. Golden Phoenix: Based on the Avatar of Courage. Emerald Phoenix: New skills, DPS and crowd control role. This would pretty much move the roles of the avatars into the pet, letting the transformed guardian focus on multiple roles in the middle of the fight. I'm really disappointed at the firebreand, since I expected some tome kits, not what we got. So, let's go back to that. Tome of Justice: Ranged DPS role, with AoE options. Tome of Resolve: Ranged healing role. Tome of Courage: Ranged crowd control and support role. Aside from that, F4 would host a new transformation, called the Avatar of Wisdom, wielding a closed tome, and using ranged AoE DPS skills. Tome kits would be available while transformed, the avatar opening his own tome at a different page when equipping each one. The skills would be similar, but stronger while transformed. Just some random ideas to begin the thread. Waiting for yours! I was always of the opinion the effects of the Virtues should have been aura effects that you can only have one active at a time but each and every Guardian skill would have had a different effect depending on which was active. So an example would be Judge's Intervention should have done what it does now with Justice active, done what Merciful Intervention does with Resolve active, and cleansed conditions and applied aegis with Courage active. Basically the Guardian should have been the magical stance dancing class that focused on Burning with Justice, Healing with Resolve, and cleansings/protecting with Courage. I would like to see guardian able to use enchantments and teardowns similar to dervish. Set up F1-F3 to change similar to the times but be enchantments and teardowns. I like that they designed guardians to be able to offer a lot of support and defense, as a guardian is by definition one who protects. I've always thought they should be worked in a way that makes them appealing as the ideal tank for end game content, but sadly that role is relegated to chrono. I'm honestly not sure the best way to fix that except perhaps to expand on the number of buffs they give or add to the variety of buffs they can offer. If the chrono is mostly wanted over guardian for the quickness, then it may just be modifying a trait or skill somewhere to give more consistent quickness. Alternatively, if their heals and defensive buffs became more potent, then perhaps a mesmer/chrono could shift into one of the dps roles and guard would become the new meta tank. If the chrono is mostly wanted over guardian for the quickness, then it may just be modifying a trait or skill somewhere to give more consistent quickness. Alternatively, if their heals and defensive buffs became more potent, then perhaps a mesmer/chrono could shift into one of the dps roles and guard would become the new meta tank. If they made Quickfire give alacrity instead of what it does currently (been over nerfed) then Guardian could compete with Chrono for tanking. In fact it would compete with Chrono entirely for that spot and then you could bring either or for it. Each class would have its own advantages and disadvantages. Chrono would of course bring more CC and boon share while the Guardian would bring more healing and general utility (replace the druid but have to take a PS Warrior) or skip healing/tanking for DPS while buffing. So, pretty much herald facets then? Always felt like they stole that idea from the guardian, and shoehorned it into revenant for no particular reason. Kind of. You wouldn't be able to have them all active at the same time like Herald and they would also affect all of your other skills. Though you have no idea how much I hate the idea of Revenant. The class served no purpose on being made, how awesome would it have been if every class received a mist based elite spec that could have been incorporated into the story. How is it that everytime I see a "how would you redesign topic",I see you up here Lonami? What I would change about the Guardian is the staff.Make staff 4 a consecration ability and water field combo. Afterwards I would make the new staff 4 deal a combo blast and remove 2 condis - a pillar of light to purge impure energies from the targeted area. I dont own PoF spambrand but i dotn mind Anet would change mantras to aoe. in the process they could change shouts to be more similiar to paragon ones form gw1, no boons just direct affects that cant stack. SMal heals when moving, condi cleanse, bit of toughness to with limited value not afected by boon duration etc. An icon of the current shout would be aplyed on the caster and allies afected by that shout, not aloweing more effects to stack. Could you elaborate on that idea? I really loved dervish back in GW1, but I'm not sure how that could work with guardian themes. Giving a unique buff or role to each profession could help, but then they would need to make something unique for each profession. Yeah, I also think it was a huge wasted opportunity, but too late for that, I guess. Let's just hope that revenants never get to steal any themes that should belong in other professions, like Shiro, who would have felt way better as a thief elite specialization instead. There aren't a lot of guardian legends out there, but still. Something that has always pestered me about guardian is that it was advertised as a defensive/support profession but isnt a viable tank. So I would reevaluate shield and focus, and look at guardians personal defensive ability and raise its base hp pool. You can build the Guardian to be fairly tanky. Kinda, sorta. The problem is that guts their damage SO badly that the only "right" way is to go Glass Cannon. But that's more a problem with the game as a whole; building for defense is meaningless. I mean, yeah, they got rid of the MMO trinity...by forcing everyone down the damage path. No place for Stone Walls or Mighty Glaciers. Guardian is one of the few classes that excluding some skills (spirit weapons) are pretty well done, and don't really require messing about with. You did a good job with some of your suggestions, but there's a point where it just gets ridiculous. You can't just go about suggesting a rework to everything in the game, or it won't be the game any more. The original tomes were actually references to monks from GW1. Almost all of the spells they offered were monk spells, and the tomes were referred to as "ancient" in their description. Unfortunately, whoever has been working on guardians for the past few years has a hate-kitten for monks and is slowly removing any references to them or any playstyle that might resemble them from guardians. As a fan of tomes and monks, seeing tomes lose their lore to get some arbitrary Elonian stuff, and seeing them converted into something that completely disregarded original tomes was a giant slap in the face for me, and pretty much made me quit the game. Right. I'm fairly sure you could build some kind of AH minstrel hammer/mace guard or whatever else that would be very tanky. However, it would be very useless in any other way, so who on earth would run it when you can have a chrono, who is tanky and farts out boons (especially the relevant ones) as if there was no tomorrow. Alternative idea for the core profession redesign, taking the spirit weapons further, mostly inspired by this awesome artwork of old. First of all, virtues are gone, completely removed. They are a boring profession mechanic anyway, and there's not lot to salvage from them. The new profession mechanic is Spirit Weapons. They're inspired by the slot skills, but they have some differences. Spirit weapons act like minions, but they don't have an AI. Instead, they float/gravitate by your side, and await orders. They are physical creatures, and thus, they can intercept projectiles. They can be destroyed, but they can't be targeted. There's four types: Swords, Hammers, Shields, and Orbs. You can equip two sets (4-6 units of the same type) at once, and then swap between them. Swords are your basic damage spirit weapon. Six total per set. Hammers are good for crowd control situations. Four total per set. Shields have a defensive role, blocking and reflecting attacks. They can also be consumed to apply aegis to nearby allies. Four total per set. Orbs adds an additional burning effect to your normal attacks, as well as your allies', much like the original virtue of justice. Six total per set. Mechanic skills F1, F2, and F3 give you some basic controls. You can throw the spirit weapons at the enemy, make them whirl around you, form a barrier, etc. Mechanic skill F4 swaps your current spirit weapon set, much like a ranger pet swap. Swapping respawns the destroyed spirit weapons. Aside from that, some weapon skills have synergies with the spirit weapons, and will make them attack together with you. Spirit weapon slot skills disappear, and get replaced by stances. These stances give additional control options for the spirit weapons. The idea behind this system is that you will have to coordinate and position your spirit weapons correctly to do things. Instead of spamming aegis to block an attack, you'll have to position your spirit shields to physically block instead, which requires some skill and interaction, and is much more enjoyable from a gameplay perspective. This would give the guardian some extra defensive measures, without having to touch things like base health and defense stats. Dragonhunter would get advanced spirit weapon options instead of the advanced virtues. Firebrand would have no spirit weapons, and get tome kits instead. The tome would float like a spirit weapon when stowed, and become a kit when wielded. I don't think the guardian needs more health points or more resistance, just defensive countermeasures. Blocks are the ideal route, not cheesy and passive like aegis, but active skills you use at the right time and the right position to prevent damage, and maybe even reflect it back to your enemy. A few of mine too. Guardian: Virtues are gone. The new mechanic is spirit weapons, which would no longer exist as slot skills. You equip two sets, each containing multiple instances of the same weapon, and swap them freely, much like ranger pets, using mechanic skill F4. The available sets are Swords of Justice, Tomes of Resolve, Spears of Courage, Hammers of Truth, and Scrolls of Wisdom. Spirit weapons work as an ammo resource, and float behind your back, forming an aureole of sorts while they await for orders. Mechanic skills F1, F2, and F3 let you consume them, with no cooldown. The maximum amount of active spirit weapons is 6, respawning every few seconds after every use, but these number might change depending on the active set and traits. If you don't consume any of them, spirit weapons provide passive effects, much like virtues before them. New stance slot skills allow you to arrange them in different ways around your character, increasing their passive effects or protecting you from enemy damage. Dragonhunter: Spirit weapons are replaced by spirit tricks. Mechanic skills F1, F2, F3, F4, and F5 let you equip 5 tricks, individually selected from a list of 10, and include situational skills like blinding dodges, healing leaps, pulling chains, reflective shields, and more, inspired by original spirit weapon skills. Firebrand: Spirit weapon sets are replaced by individual greater spirit weapons, which are wielded manually, similarly to an engineer kit. Each of the original five sets has its own greater version, which you can wield with no time restrictions of any kind, replacing your weapon skills with the chosen great spirit weapon's new skills. These new weapons are not wielded manually, instead floating near the firebrand's hand, much like the original guardian tomes or Balthazar's greatsword. Original mechanic skills disappear, replaced by mechanic skills F1 and F2 containing access the two greater spirit weapons of your choice. Previous passive bonuses are now granted by not using the greater spirit weapons constantly. Forgemaster: You can now combine both spirit weapon sets at once, mixing different types together, and doubling your maximum amount of spirit weapons, gaining new upgraded F1, F2, and F3 mechanic skills based on combos of the original versions. You can combine your spirit weapon sets with the new F5 mechanical skill, and split them again using the same key. Stormcaller: Your spirit weapons are now wielded by ghostly minions, who charge into battle on their own. Mechanic skills F1, F2, and F3 are replaced with pet controls similar to those of the ranger, letting you command the ghostly soldiers. Your new allies do not need to be consumed, but they can die in combat. Previous passive bonuses are now granted by keeping your allies alive, for which the new banner slot skills might help. Mechanic skill F4 now swaps the weapons of your ghostly army, healing them in the process. Paragon: You can now merge with your spirit weapons, temporarily transforming into an archangel-like being. Your physical appearance will change, and your weapon skills will be replaced with new options, both tied to the spirit weapons consumed for the fusion. The transformation consumes all the active spirit weapons, lasting longer the more it consumed. Mechanic skill F5 is used to transform, disabling all other mechanic skills until the transformation ends. Been a while since I've tried anything for the guardian, so I guess it's time for an update. My main goal is to give guardian a meaningful core mechanic, where virtues are more than some auxiliary signets. I always felt like the revenant's herald elite specialization felt more fitting for the guardian than the revenant, and that's my main source of inspiration for the guardian's new core mechanic. I've also considered core virtue changes for dragonhunter and firebrand, expanding on the new foundation. Auras have been repurposed as a new type of effect, and renamed as Wards. Like other effects, wards have a limited duration and a number of stacks. The active effect of a ward only triggers when you receive direct damage, consuming one stack every time until you run out of them, in which case the ward effect is removed. Hard crowd control effects can be used to remove multiple ward stacks at once without triggering the active effects. Aegis is no longer considered a boon, and is classified as a ward now. Facets have been renamed as Auras. New mechanic skills F1, F2, and F3 contain auras now. Use once to activate the passive effect (Aura), and again to consume it and trigger an active skill (Overload). There are four sets of auras to choose from, and you can equip two at once, swapping between them by using mechanic skill F4. Overload attacks are performed through spirit weapons, summoned automatically by the overload skill. Each set is based on a different spirit weapon, these being Swords of Justice, Hammers of Fate, Spears of Resolve, and Shields of Courage. Once summoned, spirit weapons can be destroyed by the enemy. F1 applies an offensive boon on passive, and triggers a combo finisher spirit weapon on active. F2 applies a defensive boon on passive, and triggers a combo field spirit weapon on active. F3 applies a ward on passive, and triggers three spirit weapons on active. Triggering the active skill of the three auras at once combines and boosts their effects, with different results depending on the activation order. Swapping aura sets while any individual auras are active will deactivate them automatically, with no cooldown costs. Spirit Weapon slot skills have been removed, replaced by Stances. Litany of Wrath, formerly a meditation, is classified as a stance now. Meditations have been reclassified as Cantrips. Shelter is classified as a cantrip now. Consecrations, Shouts, and Signets keep most of their functions intact. Base health gained per level has been increased, from a total of 1,645 to 5,922, leaving guardian in the medium health tier. Auras have been replaced by Marks. Mechanic skills F1, F2, and F3 contain marks now. Use once to mark an enemy target with the passive effect (Mark), and again to consume it and trigger an active skill (Strike). Marked enemies receive a negative effect, and become more vulnerable to your attacks. Strike attacks automatically target the enemy wearing their respective marks, and can't be manually directed against other targets. Marks are determined by the active weapons. Swapping weapons will swap marks as well. F1 is determined by the main-hand weapon, and lets you impair the mobility of your marked target. F2 is determined by the off-hand weapon, and lets you improve your own mobility. F3 is determined by the main-hand weapon, and lets you channel a powerful attack against your marked target. The longer you channel, the stronger the effects. F4 contains an universal Mercy skill, and lets you reset the marks, removing the active ones and refreshing their cooldowns. Longbow and Traps keep most of their functions intact. Mechanic skill F5 contains a Scroll now, letting you replace your slot skills with new scroll skills based on your active aura set. Scroll activation summons a total of six spirit weapons, floating by your side while they wait for orders. Each scroll skill requires a specific amount of spirit weapons to be activated. Spirit weapons in use will remain busy until the skill's effects are over, reducing the number of available spirit weapons for the other skills. Spirit weapons can also be destroyed, reducing your resources even further. Activating the scroll automatically activates all auras, and lets you use overloads multiple times without consuming the auras. Overloads require spirit weapons too, and they keep them busy as well. Axe off-hand has been enabled. Axe main-hand and Mantras keep most of their functions intact. If you've checked the other profession redesign threads, you'll know my primary goal is to normalize core mechanics, and build elite specializations from a dual profession viewpoint, mechanic-wise. Dragonhunter uses marks, the new thief core mechanic inspired by the deadeye, and firebrand uses scrolls, the new revenant core mechanic inspired by legends. Mechanic skill F5 contains a Transformation now, providing an attribute boost, and physically transforming you into an archangel-like creature. Both are based on your active aura set, each providing different attributes and aesthetics. Transforming requires a new resource, represented by an energy bar. Weapon and slot skills are not directly affected by the transformation. Overloads have been upgraded into Paragon Overloads. Instead of summoning spirit weapons to perform the overload attacks, the paragon executes them himself manually, by jumping at the target area. Polearm is the new weapon, designed for close combat against multiple enemies. Banners are the new slot skills, designed to boost the passive aura effects. Auras have been replaced by Minions. Mechanic skills F1, F2, and F3 contain minions now. Use each of them to summon a different ghostly minion. Only six ghosts can be active at a time, the older one despawning if you summon a seventh. Summoning minions requires a new resource, represented by an energy bar. There are four sets of minions to choose from, each of them based on a different squad of ghostly Ascalonian soldiers. Ascalon's Chosen was formed by the best soldiers of the kingdom. It includes minions wielding swords and shields, polearms, and longbows. The Ebon Vanguard scouted the Northlands and beyond. Includes minions wielding axes, spears and shields, and shortbows. The Flaming Scepters was a guild of elementalists from Nolani. It includes minions wielding daggers, scepters, and staves. The Thunder of Rin introduced dwarven powder to Ascalon, late into the war. It includes minions wielding maces and shields, pistols, and rifles. Warhorn is the new weapon, designed to support the ghostly minions. Reinforcements are the new slot skills, letting you boost the minion mechanic by summoning additional specialist ghostly units. The healing slot skill lets you summon monk reinforcements. The utility slot skills lets you summon a houndmaster with his pets, a mesmer, a necromancer with his minions, or an assassin. The elite slot skill lets you summon a captain, boosting nearby allies while he's active. The four aura sets have been merged into a single aura each, their three passive effects applying all at once. However, now you can only activate one aura at a time. Overloads have been upgraded into Monk Overloads, and their effects now apply in a point blank area around the monk. F1 contains the three effects from Swords of Justice. F2 contains the three effects from Hammers of Fate. F3 contains the three effects from Spears of Resolve. F4 contains the three effects from Shields of Courage. Fists are the new weapon, designed for ranged support. Wells are the new slot skills, designed for healing and support. Guardian was kinda hard to redesign, but I'm pretty happy with how it turned out, so I hope you like it too! And remember, this thread is just for fun, so feel free to post any ideas you have, even if you believe there's no way they could be happening. No matter how many utility Anet give to guardian , ppl will always choose chrono. No matter how many time Anet nerf/cripple chrono, people who invest most of resources/time on it will try to fix it and convince others "chrono is still the best option "
Because most of us dont like big change. Yes, the Health Pool! That would be a pretty big bump to start with. It doesn't have to match a Warrior's pool but maybe match that of a Mesmer without the need to use Force of Will. I would increase health to tier 2. And virtue would I have a minor master granting stats bonus for passive virtues: no idea what for VoJ, but healing power for VoR and toughness for VoC. Maybe play around the spirit weapon as with the gyros from engineers. I would maybe also do something with dragonhunters auto atrack.. the sound and speed feels odd. And well maybe speed up the cast time for the other abilities and lower the dmg to balance it out. Oh and in open world lower the CD on hunters wards 45 seems like too long, but in wvw it is powerfull so I understand the CD there. Bow: Can't really say what's nice for this one at the moment. They run active, let's say, for 5 to 8 seconds but you can press the skill again to get an active effect similar to what we have at the moment. Then run an understandable CD. I think someone here said (or was that in another thread) that they should be held by Ghostly Warriors that stand and fight with you. I did like that idea also but it sounded like the version 1 of spirit weapons that had a health bar; can't say I want to go back to that version. I happen to enjoy the version of Spirit Weapons at the Moment but feel that they need a bit more work to truly shine. Why is this typing in all caps? It's not my keyboard. EDIT: There, it reverted. That's what I get for doing an nVidia update in the background while posting. First and foremost, raise guardian base HP to equal revenant, where it should have been from day one. Give guardians a real self-heal, something in the same category as the ranger We Heal As One or warrior Mending. All our current heals are gimmicky and have long cooldowns. Fix DH longbow. When 80% of the people who play a spec don't use the weapon it came with, that should be an instant red flag that it's screwed up.